Aric Almirola’s win of the rain-delayed and rain-shortened Coke Zero 400 at Daytona (Fla.) International Speedway on Sunday wasn’t only the first-career win for the driver, it was the first win for the iconic No. 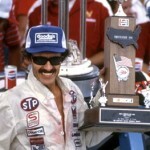 43 car since 1999 and just happened to come two days past the 30th anniversary of car owner Richard Petty’s legendary 200th (or 199th-see interesting fact, below) and final-career Winston (now-Sprint) Cup win at the same track in 1984. 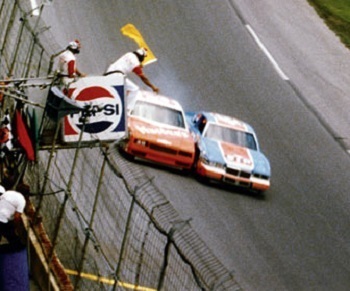 In honor of that recently passed anniversary and the social media trend of “Throwback Thursday,” we look back at the 1984 Firecracker 400. 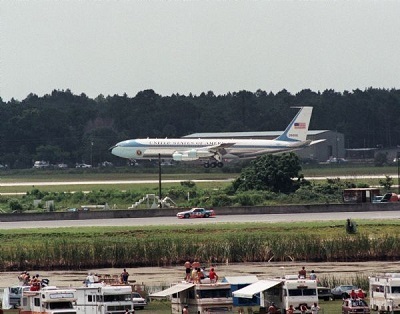 The race got underway with the command to fire engines from President Ronald Reagan from aboard Air Force One, en route to the speedway. 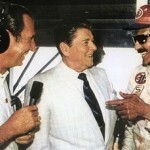 Regan then took in the race from one of the press box, even calling a small portion of the race for the Motor Racing Network (MRN). Forty-two drivers started the race, and Petty won after getting to the start-finish line first with two laps remaining in front of a reported crowd of 80,000 fans. Those final two laps ran under caution after Doug Heveron flipped his car in turn one, as there was no green-white-checker rule back in those days and drivers raced back to the the start-finish line when the yellow flag was displayed. 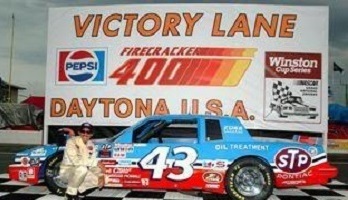 The win was somewhat controversial as the rumor circulated that Petty ran the race with an illegal engine built by DiGard Racing and leased to Curb Motorsports, the team for which Petty was driving. 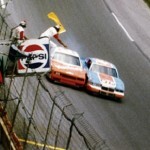 There was also a dispute between the two race teams over missed payments. Petty, himself, reportedly made the missed payments. 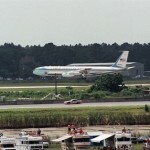 Despite the rumor, according to evidence obtained by NASCAR, the engine was legal. 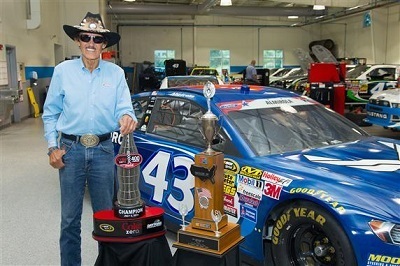 Interesting fact: If you believe that another NASCAR Hall of Famer, Bobby Allison, has 85 premier-level wins, as opposed to the 84 reported by NASCAR, you’d pretty much have to concede that Petty has 199 wins, not 200. Among Petty’s 200 reported wins is the 1971 Myers Brothers 250 combined Grand National (forerunner of Cup) and Grand American race at Bowman-Gray Stadium in Winston-Salem, N.C. In the combined races, both a Grand American and Grand National winner were crowned. Grand National cars traditionally finished first, but in the 1971 race at Bowman-Gray, Allison crossed the line first in a Grand American entry. 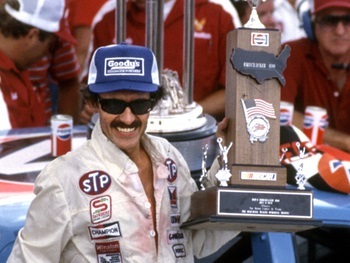 Petty was declared the Grand National winner after finishing second, overall, but first among Grand National winners. 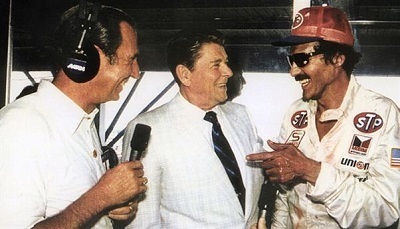 Some, including Allison, himself, consider that a Grand National win for Allison because, despite being in a Grand American car, he beat all the more powerful Grand National entrants. Those who consider Allison the winner would, as a result, have to remove a win from Petty’s stats. Win 199 or win 200, here’s the top-10 finishing order of the 1984 Firecreacker 400: 1. Petty, 2. Harry Gant, 3. Cale Yarborough, 4. Allison, 5. Benny Parsons, 6. Bill Elliott, 7. Terry Labonte (who would go on to be series champion in 1984), 8. 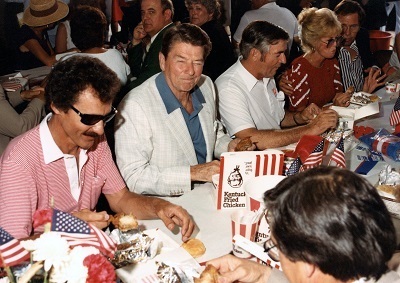 Dale Earnhardt, 9. Neil Bonnett, and 10. Joe Ruttman. Yarborough was the driver who battled Petty to the line when the caution came out, but after damage to his car from said battle, he wound up giving up second to Gant. There were 13 cautions for a total of 15 laps, and the race saw 29 lead changes. The average speed of the race was 171.204 mph. 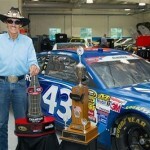 The total race purse was $336,550, with Petty’s share as the winner being $43,755. Petty started the race from the sixth position. Yarborough was the race pole sitter. 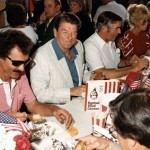 After the race, drivers chowed down on some Kentucky Fried Chicken (that was before folks commonly shortened the chain’s name to KFC) with the President. Wonder if there were jelly beans for dessert? 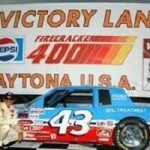 By the way, the 1984 Firecracker 400 is available on DVD. I found a place where you can order it, here.